Originated at the Morden Research Station, Agriculture Canada, by Dr. C. R. Ure, for the Prairie Fruit Breeding Cooperative, selected at the University of Alberta and Beaverlodge Research Station, Alberta in 1958 and introduced in 1976. The tree is moderately vigorous, upright spreading, precocious, annually productive and hardy to zone 2. 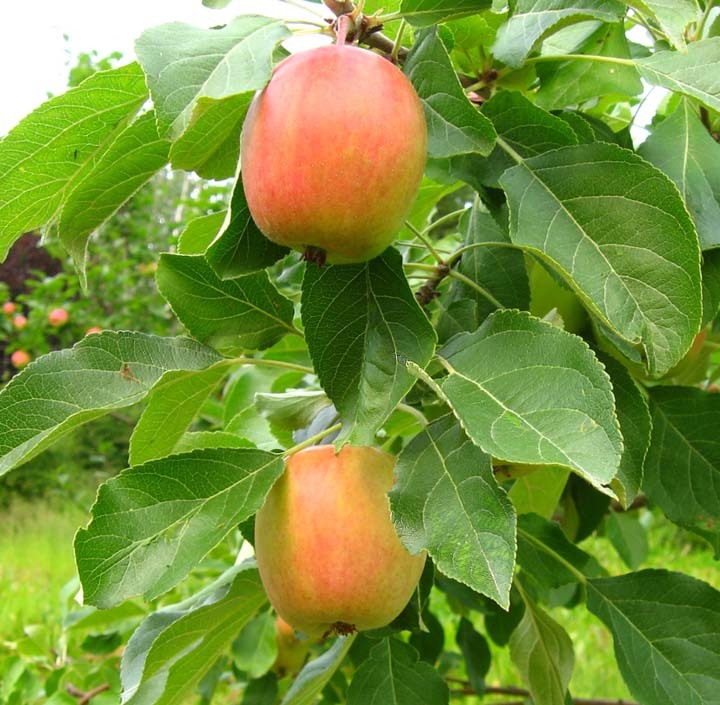 The fruit is small, 5 cm (2 ") in diameter, barrel shaped to round conic, and matures in late August to early September. The skin is greenish-yellow base, and almost completely washed with dark red. The flesh is cream-coloured, crisp and juicy with a pleasant flavour. It is very good for fresh eating, good for cooking, and stores well for at least 18 weeks. Note: It has been susceptible to fire blight in Saskatchewan. Does not appear to take well on bacatta. Doesn't seem to like our orchard at all, for a reportedly hardy tree all have died either quickly or slowly. Probably 5-6 have died over the last 4 years. One last try is potted up and we'll see. It may be my last attempt with this variety before I move on to test others.